We are proud to announce that we have an awesome sponsor offering one of our lucky readers a PlasmaBike. Help me promote the giveaway and get a FREE Facebook/twitter link on the Rafflecopter. 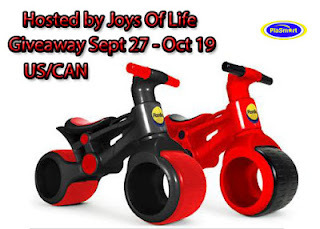 This giveaway host is Joys Of Life. Co-host Empowered Mommy! Blogger’s Event – September 20 to September 26. HTML goes out on September 26, 2012. Requirements: Participation is FREE when you post an announcement on your blog about the event OR pay $5.00 for no announcement post. You will receive one free link in the Rafflecopter entry form (Facebook or Twitter). Additional links are available for $2 each (including Facebook, Twitter, Pinterest, Picket Fences, Email, Rss, or StumbleUpon). You MUST agree to help promote the event at least once per day to help spread the word and publish the post HTML by the specified date and time of 12:01 am. EST. To use the image above, right-click and copy the image. Save it and then paste it within your announcement post.